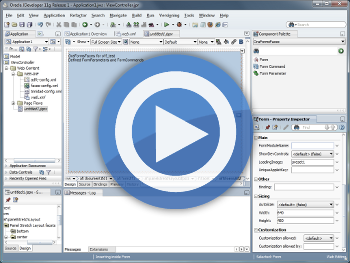 OraFormsFaces™ is a JSF component library to integrate Oracle Forms in a JSF web application. 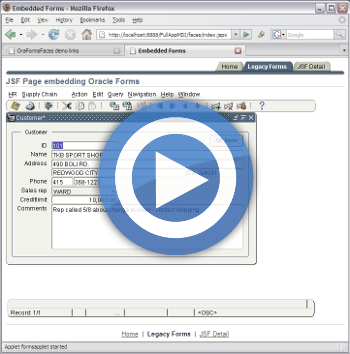 This allows a developer to embed Oracle Forms in a JSF page and truly integrate the two, including passing context, events, eliminating Forms applet startup time, and many more features. This is the key technology to complement Oracle’s offerings. Forms is a mature product and Oracle has a great Java stack, but unfortunately it’s not possible to really integrate the two in a single application. This leaves many of the traditional Forms users with a dilemma. These organizations might want to use the Java stack for new developments, but they don’t want to be forced into a rewrite or expensive and risky migration of there Forms application to this Java stack. OraFormsFaces allows organizations to use the Java stack for new developments while protecting their investment in Oracle Forms. They can build new JSF or ADF Faces based web applications and integrate existing Forms applications in them. 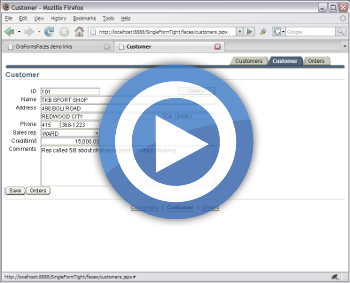 The JSF web application can pass parameters to Forms and the other way around. Both Forms and JSF can raise events (commands or triggers) in the other technology. 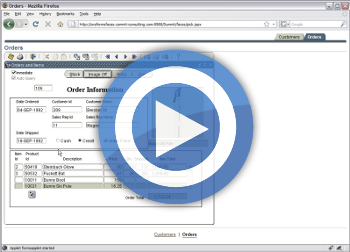 With the possibility of integrating Forms into JSF, it is also possible to go one step further and integrate Oracle Forms in any other web technology, whether it is Oracle Portal, Oracle WebCenter, PHP, ASP.Net, or something else. 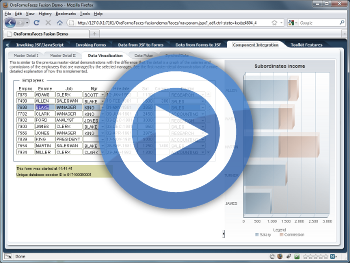 See the demo movies below to get a feeling for the capabilities of OraFormsFaces. You can also download OraFormsFaces that is packaged as a JDeveloper extension. Simply download the ZIP file and install it in JDeveloper using “Check for Updates” under the Help menu. OraFormsFaces supports both JDeveloper 10.1.3 and 11.1.1. The JDeveloper extension includes a demo application showcasing the capabilities of OraFormsFaces. You could also look at the OraFormsFaces Developer’s Guide to get a feeling for OraFormsFaces’ capabilities. Be sure to also read the most recent Release Notes. If you do run into any problems, feel free to ask at the forum or file a bug report in the issue tracker. 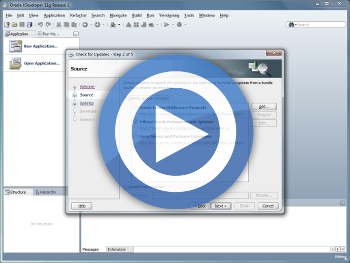 A number of screencasts are available to show the different features of the OraFormsFaces™ component library. These movies show the end result, a running application in a web browser that use OraFormsFaces. These movies show what a developer needs to do to use OraFormsFaces in a JDeveloper environment.